She loves bread. That's really all you need to know. Not much else is really known about her, in fact! Is she MADE of bread? Is she inside of a gigantic robotic-like suit comprised of baked goods? We do know she is a mouse of some kind and, being a mouse, she also loves cheese. So, naturally, Grilled Cheese would drive this mouse WILD. Cheese AND bread? TOGETHER?! 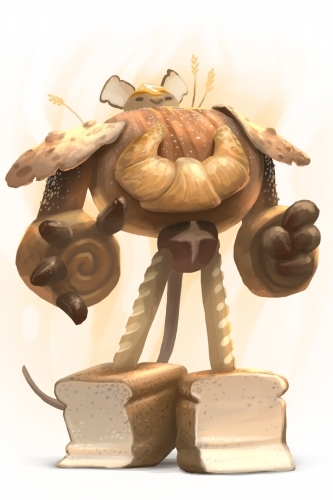 Collect Packets of Flour in the Windmill to create Grilled Cheese and free the Windmill from her breaded tyranny! The Captain Croissant Mouse is attracted only to Grilled Cheese. A single piece of Grilled Cheese can be purchased at the Windmill Cheese Shoppe in exchange for 12 Packets of Flour. No Charms are required to attract the Captain Croissant Mouse. Hunters can encounter the Captain Croissant Mouse only in the Windmill location. Having caught the Captain Croissant Mouse, the gears, cogs, and sails of the Windmill are finally clear of all the mice clogging them up. The Windmill is now operating at full capacity! I can return to the Windmill whenever I need to fill up on some Grilled Cheese! The Captain Croissant Mouse drops Packets of Flour and Ancient Relics as loot. Attraction info and special event loot drops for the Captain Croissant Mouse can be found at the individual event location pages. The Captain Croissant Mouse drops the Croissant Egg during the annual Spring Egg Hunt. 2 September 2014: The Captain Croissant Mouse was released. This page was last edited on 9 February 2018, at 02:24.